On October 26, 1975, a letter was sent to His Beatitude, Metropolitan Ireney, requesting permission to establish the orthodox mission of St. James the Apostle. The founder of this mission was Very Rev. George Gladky of blessed memory. (This is only one of the many that Fr. George founded in his lifetime). The first council and members consisted of Fr. Basil Wagoner priest in charge of the following: William & Anna Basara, Alexander & Ruth Sirotkin, Ana Bobiansky, John & Eva Harris, Nicholas Prosk, Phyllis Wagoner and Mrs. John Peterman. Other founding members were Sergei & Maria Nekrassoff and Justine Boone. 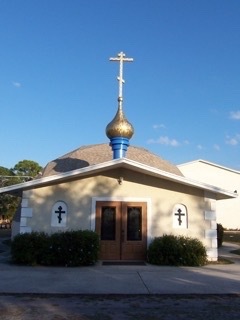 The group started their meetings and services at borrowed quarters of St. Mary Episcopal Church in Stuart. 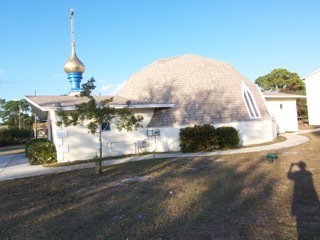 Soon, a lot was purchased in Port St. Lucie and on June 16, 1978 construction was started on the geodesic domed church. It would become a local landmark and by the fall of 1979 the temple was sufficiently completed and Divine services were held for the first time. Fr. Ernesto Rios on loan from the Diocese of New York/New Jersey came and served the latter part of the first Holy Week at St. James in March of 1980. He was assigned to St. James as the first permanent priest on July 1, 1980 and still remains as pastor. During the 1980's three priests retired to Port St. Lucie, Fr. Dimitri Kudrikoff, Fr. Nestor Geeza and Fr. John Rachko. All have been called home by Our Lord. May Their Memory be Eternal! Currently, we are blessed to have retired priest Fr. James Mason serving with us. A Fellowship Hall was completed in November of 2002 that added to the growth of the mission. From 2006 through 2009 our mission began to outgrow our little church. Fr. Ernesto appointed a building committee that gathered information which it presented at a special parish meeting in February 2010. The parish voted to build a new temple and the building committee was empowered to bring it to fruition. On Saturday, September 18, seven priests concelebrated a Divine Liturgy followed by the Blessing of the Land and a Ground Breaking Ceremony. Actual construction began in January 2011 and by God's grace the first Divine Liturgy was celebrated in our new church on Sunday, August 21. On Saturday, September 10, 2011, our new temple was consecrated by the Primate of the OCA, His Beatitude Jonah, His Grace Alejo, Bishop of Mexico City and His Grace Mark, Bishop of Baltimore. The new temple is beautiful but it will not be complete until the iconostasis is installed and all the iconography inside is finished. This has truly been a labor of love and trust in our Lord. We have been blessed with St. Mary's Sisterhood which has labored under various leaders during the past 25 years. Marilyn Rinehart of blessed memory was it's first president and set the tempo for its service that continues today. 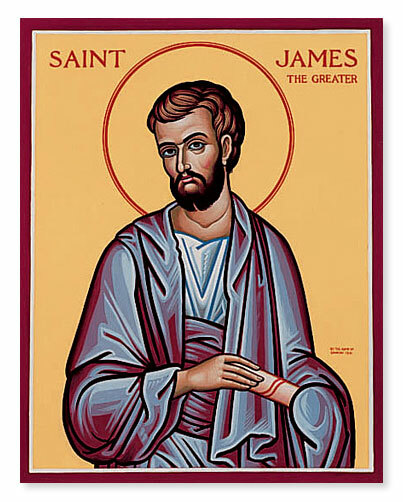 A more recent addition to our parish life is the St. James Brotherhood that sponsors many activities of fellowship and helps our wherever needed. Our parish family of St. James is made up of members from many different and diverse ethnic backgrounds, all sharing a spiritual life and love in Christ. As St. Paul writes "For as in one body we have many members, and all the members do not have the same function, so we, though many, are one body in Christ, and individually members of one another." Romans 12:4. We now must continue to grow in the Holy Spirit and use all of the talents and spiritual gifts God given to us in continuing to build up the Body of Christ in this Holy Temple entrusted to us. 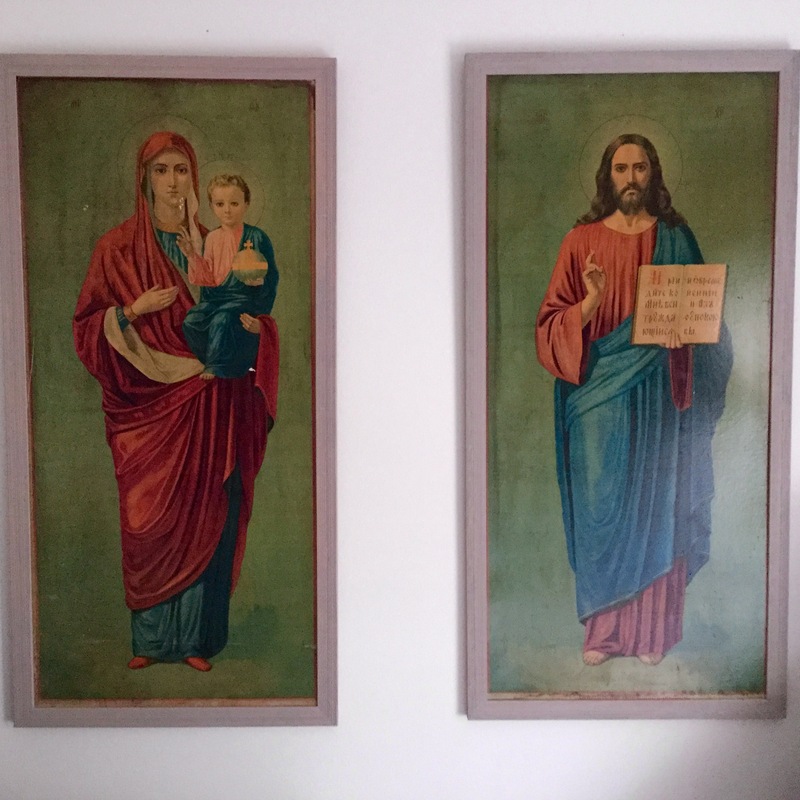 These are just a very few highlights of our parish life history. Now we are at a new beginning and yet it is the continuation of the Orthodox faith and Church which will endure until the end of time.